I can’t believe how long it’s been since I posted. I’ve been really busy the last three months, and somehow this blog got left behind. Meanwhile I’ve accumulated two readers’ gallery posts-worth of beautiful braid pictures and now, finally, a whole luxurious free Sunday to start posting them. Thank you to everyone who contributed pictures—both for your generosity and your patience! Sawyer loves flat 7-loop braids, I think the only square one here is the snippet at the far left of a beautiful bicolor yellow and black square braid. 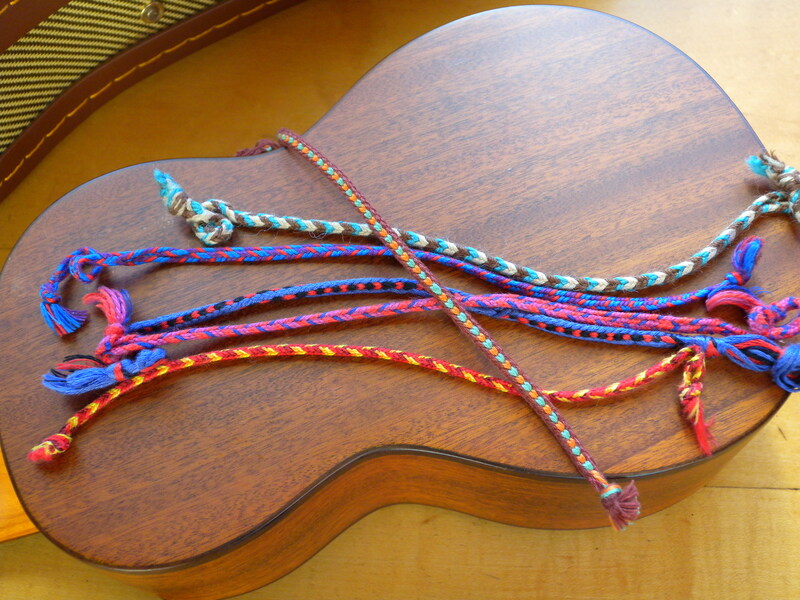 Both she and Ramona have also learned the Spiral braid (blue and black, far right) and another Medieval braid—the “Barleycorn” or “Grene Dorg” braid. 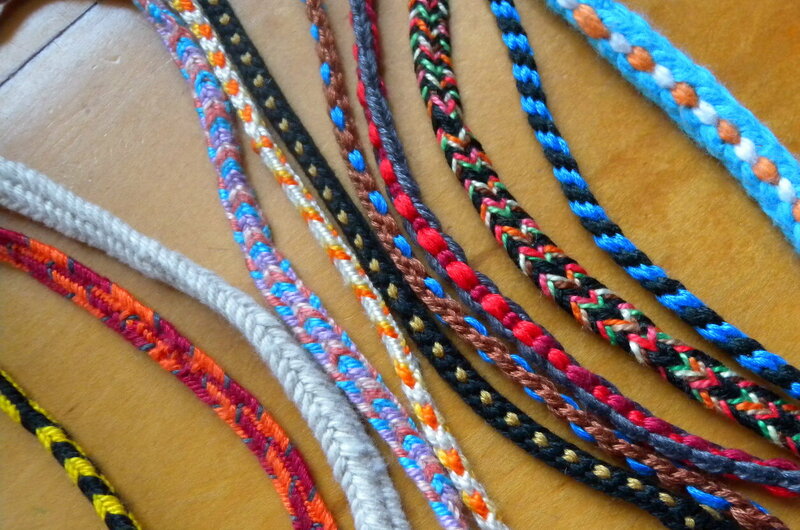 See the black and gold braid (plus the two braids to its right), and also the large blue, white and orange braid. The braiding moves for Barleycorn are an interesting combination of those of the square braid, and those of the Spiral Braid. The braid above is a cool variation of Barleycorn—it’s one of those fun discoveries that sometimes arise from mistakes. 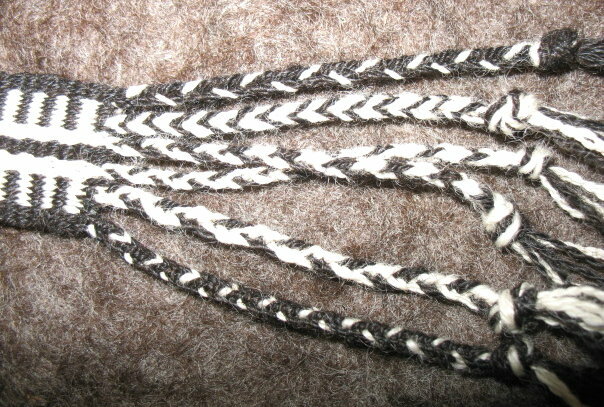 If you purposely and regularly make a common ‘mistake’ in Barleycorn (do one section without exchanging the contrasting loops), there will be alternating long and short barleycorn “kernels,” and also bead-like indentations in the outer edge of the braid. The next picture proves how late this post is. Patty had taken one quick, drop-in workshop from me at a music camp last summer. Then she bumped into this blog shortly after Christmas and contacted me. 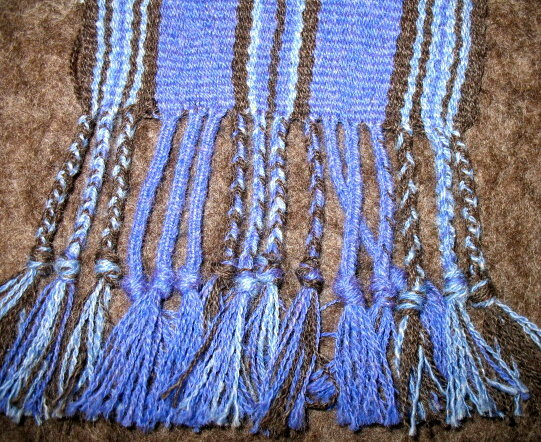 I think she had already made more braided FO’s (finished objects, as opposed to samples) than I ever have. She and Sawyer really use their braids. But Patty might take the prize for the most innovative use. It’s hard to see the actual braid in the picture below, but it is being used to suspend her family “Christmas tree” from the ceiling! 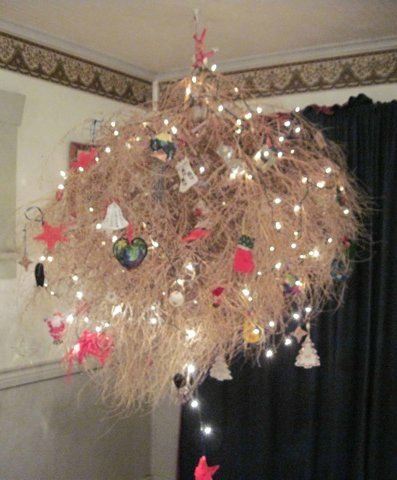 The “tree” was her husband’s idea—it’s a tumbleweed! I love this—Salsola tragus, a.k.a. Russian thistle, is a noxious weed all over the American west. It’s not native (got imported here from Eurasia somehow), so desert plant-lovers like me are always sad to see it out in nature crowding out the native plants, but it is such an icon—and how great to hang it high and cover it with holiday decorations! 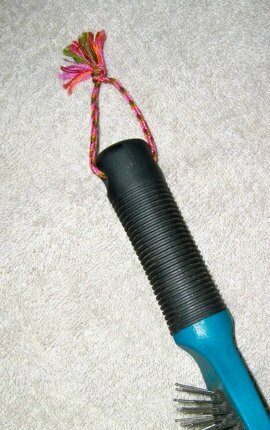 A braided hanger for her dog-brush, and a sweet little key ring, holding an extra key onto a lanyard that only had room for one. I like the tassel on the brush hanger—the embroidery floss ends combed out into separate strands with all their rich colors melding together. 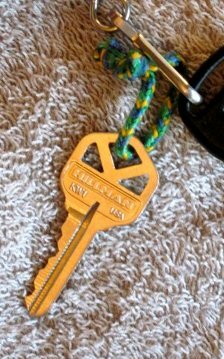 How beautiful and useful this key-holder is! 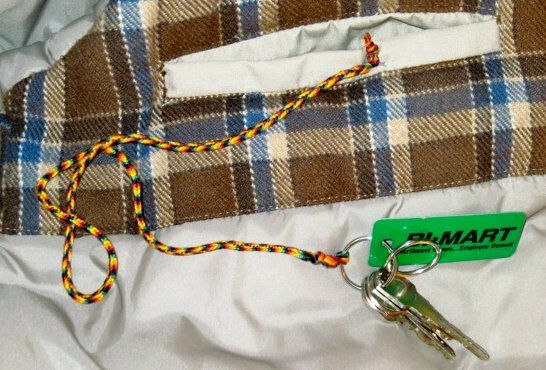 Patty pinned it to a pocket inside her winter coat to hold an emergency extra set of keys. It is really long, with a divided area for a loop at each end (they don’t show in this picture). I’m a firm believer in braiding loops into both ends of utility braids—you never know when they’ll come in handy. 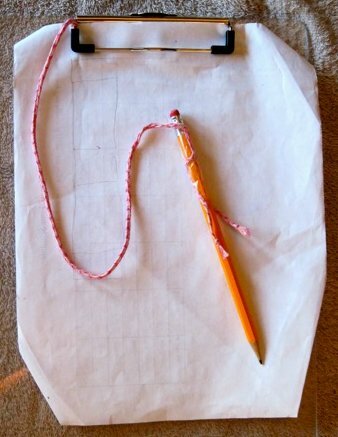 I need this for my crossword puzzle clipboard! Patty mentioned that the braid is only barely long enough, even though she had been very careful about measuring out enough thread. This has happened to me too—it’s usually because I haven’t factored in enough length for “take-up.” As you braid, some of the length of the thread gets taken up in going back and forth across the braid. The amount of take-up varies depending on the type of thread, the width of the braid, and your tension, so it can be hard to estimate how much extra length to allow for take-up. Dominic contacted me a couple of days after I finally posted a video for the 7-loop spanish braid tutorial. In two days, he had learned the spanish braid (in Spain, too!) 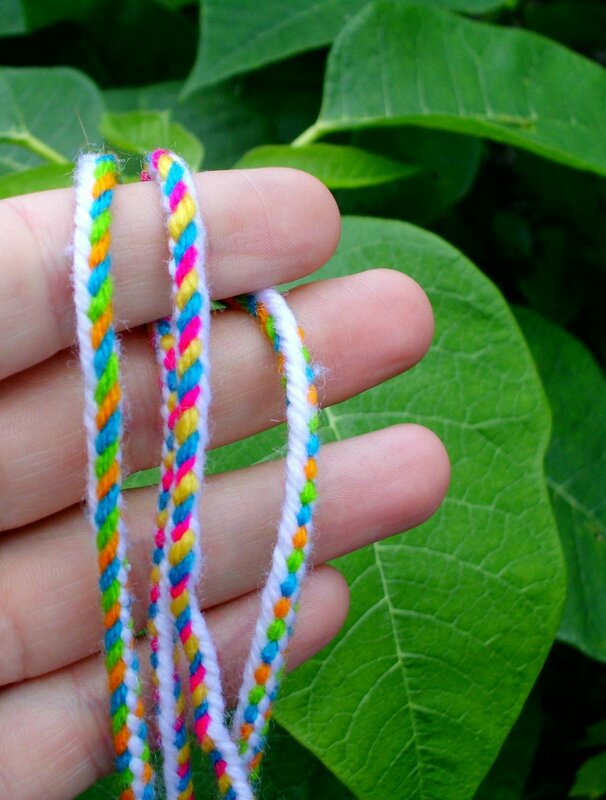 and had already used it to make a bracelet with a knotted loop closure and a bicolor Star Knot button, like the ones he shared in my first Reader’s Gallery. The loop-buttonhole he’s braided is quite different than any of the ones I’ve used—in his first photo, look below the Star knot button at that great-looking rim-like section where the loop attaches to the main part of the braid. 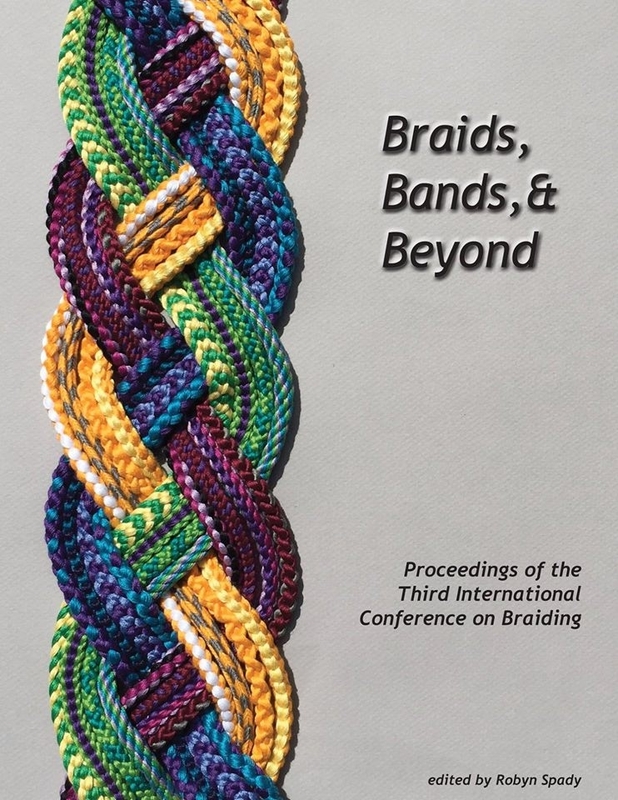 Dominic is coming to Braids 2012 this August, so I will get to meet him in person, plus (I hope) learn a knot or two from him on the side. I think there’s a different pattern to each of these five end-fringe braids! I met Janet in one of Laverne Waddington’s backstrap weaving workshops, where she was assisting Laverne. As a workshop bonus, Janet demoed how she combs and spins very fine, high-twist weaving (or braiding) worsted. Then we even got to weave with her yarn. The spinning demo was one of the highlights of the workshop for me. I keep thinking I want to try spinning some day (when???) and I’m not interested in making soft fluffy fat yarn, I only want to make skinny, smooth, hard-wearing yarn. The problem is that I want to skip the whole initial practicing part where the yarn turns out slubby and bumpy and not good to braid with! 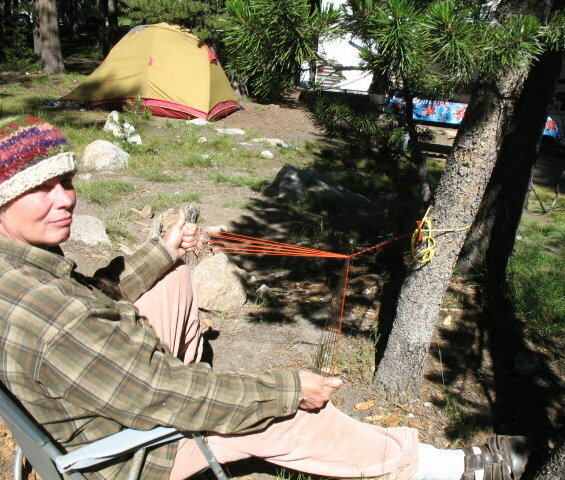 Here’s Janet braiding in Yosemite… I love this picture, especially since braiding and camping are two of my favorite activities. Wait a minute—I see loops on those thumbs! Yay! Ok, this is it for part 1. I have so many photos and ideas from readers that I’m splitting them into two posts. I’m going to try to get the next one up in a few days, though, not a few months! April 15, 2012 in Color patterns, Easy braids, Loop Braiding, Readers' gallery, Spanish braids. Ingrid !! Thank you so much for posting our pics !! It’s nice to hear from you.. I was starting to worry..
Hi Ricky! Yeah, I was starting to worry, too! I love opening my blog now and seeing your photo there, so much happier than that dreary note about the Sopa and Pipa protest. 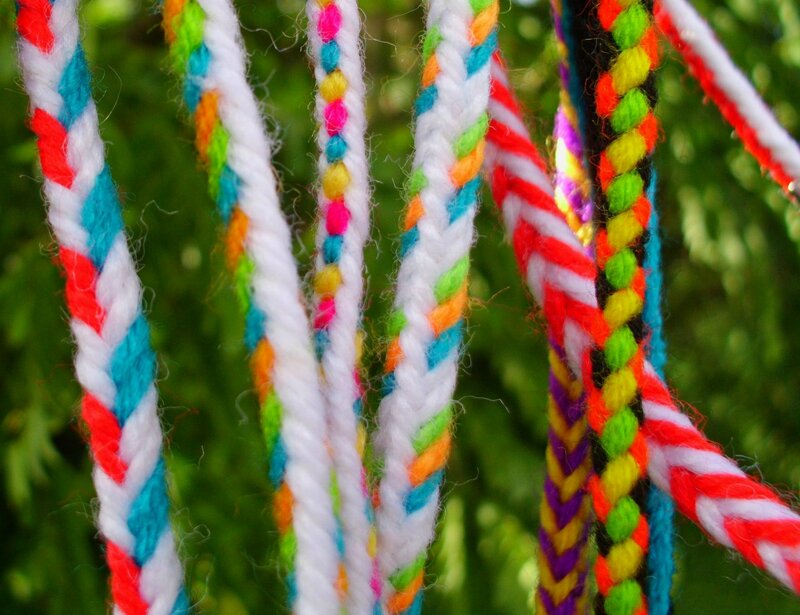 Thanks for your great photos!–…Happy braiding and knotting!